CAREER HIGHLIGHTS: Has led Daimler since 2006 and the Mercedes-Benz passenger cars division since 2005. Joined Daimler's research division in 1974 and served as Chrysler chairman and CEO from 1999 until 2007. REASON FOR WINNING:His bold move to aggressively increase Mercedes' compact lineup is paying off. Strong demand for compacts such as the CLA sedan and GLA SUV pushed Mercedes' sales above 1 million in the first eight months, a 12 percent gain on the year before, and helped the automaker gain ground on BMW and Audi. In addition, the high-tech S-class flagship, which can drive itself at speeds up to 60kph, has helped increase margins and boost the brand's image. 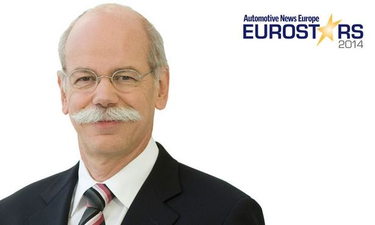 The success has given traction to Zetsche's aim to make Mercedes the world's top-selling premium automaker by 2020.